Born April 26, 1922 in Lanark, Bear Lake County, Idaho to Owen Roberts and Mary Ann Watkins. Died April 4, 2014 in Montpelier, Bear Lake County, Idaho at the age of 91. Dean was married to the love of his life, Phyllis Lurlene Long for time and all eternity in the Logan Temple on December 10, 1941. Lacking one month, they lived their lives together for a total of 73 years until her death on November 9, 1913. 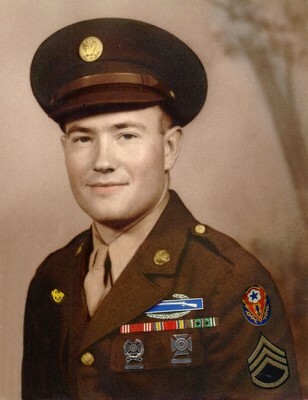 He gained a strong testimony of the love of his Savior Jesus Christ and his Father in Heaven through his World War II experiences and knew his life there had been spared many times. He was grateful to his Father in Heaven for allowing him to return home to be with his beloved wife and family. Although he endured many hardships in life, he always wore a smile and continually set a good example for his wife, children and those around him. He always made the best of every situation and never complained. Dean was active in the Church of Jesus Christ of Latter Day Saints all his life and served in many positions in the church. He has left a legacy of faith, hope, courage, and love to those he left behind and will be missed by all. Dean was proceeded in death by his parents, eleven siblings, LaVeda Ann, Viola, Ezra Owen, Iretta, Willis, John Thomas, Lawrence, Wanda, Pearl, and twin sister Jean, his wife Phyllis and two children DeeAnn and Lynn. He is survived in death by his seven children, Gary, Lurlene, Kay, Verlin, Doneal, Glen, and Rick, together with his 42 grandchildren, 60 great grandchildren and 1 great great grandchild.